Good Safety: Resident security “assistant” makes debut at Grace Ridge - Grace Ridge Retirement Community - Morganton, N.C.
There’s a new “assistant” at Grace Ridge named SARA and her job is simple: Give residents peace of mind so they can continue living active, vibrant lives without worrying about getting immediate help if they have an emergency. SARA, which stands for Situational Awareness and Response Assistant, is a newly implemented program that integrates with Grace Ridge’s current emergency and security systems. 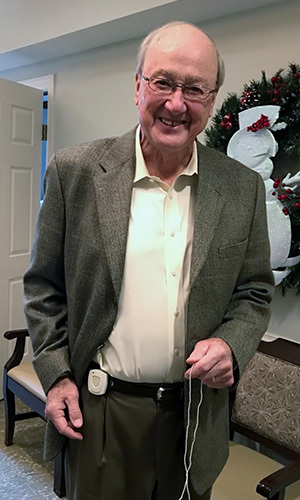 Residents wear a call pendant that notifies the appropriate first responder in real-time, while simultaneously alerting staff during emergency situations. In the event of an emergency, residents simply call for help using their pendant; the web-based system identifies their location at the time of the event. The pendant features a hands-free, two-way talking device, so if residents are unable to press the pendant they can still call for help. When a distress call is placed, it alerts a Grace Ridge first responder, who will identify the location of the call and quickly respond to that area. The system is continuously monitored by Status Solutions, which sends daily reports on alerts and the battery life of each pendant. She added that enhancing technology has been a key initiative of Grace Ridge’s strategic plan for the last three years. The Enhancing Technology Initiative Team, comprised of residents and leaders from Grace Ridge and Carolinas HealthCare System Blue Ridge, spent a year researching safety systems and interviewing other communities that use SARA before selecting Status Solutions.